The Colorado State University College of Business was founded in 1966, decades after the founding of the university. 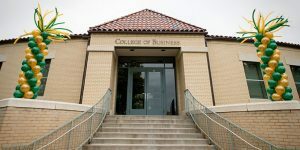 The graduate program received its AACSB accreditation in 1976, and in 1995, the business school moved to its current home in the three Rockwell buildings on its Fort Collins campus. The school has continued to expand over the last twenty years with the addition of a business minor, undergraduate concentrations, and extensive building renovations. Colorado State University’s College of Business is located on the northern end of the CSU campus, in the heart of Fort Collins, Colorado. Fort Collins is an hour north of Denver and an hour northeast of Boulder, with a distant view of the Colorado Rocky Mountains. While a little further than some of the business schools situated in the heart of the state capitol, students can enjoy a true college experience with a beautiful, expansive campus within the larger CSU system. The College of Business campus is located about an hour away from the Denver International Airport. The Business School is comprised of three buildings: Rockwell Hall, Rockwell West, and Rockwell North—colloquially known as Classic Rock, New Rock, and Third Rock. The majority of classes are held in Rockwell Hall, and the two other buildings mostly house other business degree programs, as well as research centers and institutes. The three Rockwell buildings are home to renovated classrooms, laboratories, study rooms, a café, and spacious courtyard. The Business School is home to just over 40 faculty members dedicated specifically to graduate business programs. These faculty members, as well as the rest of the faculty within the greater Business School, place a strong emphasis on research and continuing education. The school refers to its research centers as “think tanks”, constantly exploring current issues and trends in the business world. With nearly 10 centers and institutes, as well as student opportunities for graduate assistantships and relevant internships, CSU’s Business School is at the forefront of collaboration and hands-on learning applications. There are currently 94 students enrolled full-time in the Colorado State University College of Business. The school’s full-time MBA is unique: called an “Early Career MBA,” the degree requires no work experience before matriculation. In addition to this distinctive option, the Business School also offers an Executive MBA that meets partly online and partly in a downtown Denver location; an online MBA for students near and far; a part-time MBA that meets two evenings a week; and a Global Social & Sustainable Enterprise MBA geared towards aspiring entrepreneurs.